Enjoy the best private charter flights in San Marino, a microstate within eastern Italy near the Adriatic Sea. Air Charter Advisors is available 24 hours a day for San Marino private jet charters, offering luxury and executive travelers around the clock aviation services and private flights worldwide. Fly with the utmost comfort and security inside a spacious, luxurious private jet. Our charter brokers offer the most most competitive rates while maintaining the highest levels of safety and service in luxury and executive aviation. We offer access to a global network of more than 10,000 planes for your flight, and around the clock services including last minute/ASAP flights. Gain access to empty leg charter flights that match your routing, and exclusive one-way deals & pricing you won’t find anywhere else. Find the right plane for your flight, at the right price for your budget. Our private charter flights to/from San Marino are available 24-hours a day. We offer access to thousands of charter jets around the world, connecting you to whichever destination you choose. Fly private to the Italian peninsula with our San Marino jet charter services. Renting a private jet is the most comfortable, stylish, and efficient way to fly to and from San Marino. Private jet charters also give you complete control over your air travel, flying on the date, time, and destination of your choice. You’ll enjoy the most outstanding flight you’ve ever experienced, compete with scenic Mediterranean landscapes and breathtaking views of the Italian regions of Tuscany, Marche, and Emilia-Romanga as your private plane approaches Federico Fellini International Airport (LIPR, RMI) in Rimini, Italy just 16 kilometers from San Marino. Officially known as the Republic of San Marino, it also goes by the informal (but fancy) name of the Most Serene Republic of San Marino. Its capital is the City of San Marino, and its largest city is Serravalle. It claims to be the oldest republic in the world, founded by a Christian stonemason by the name of Marinus in the year 301. Located on the Italian Peninsula to the northeast of the Apennine Mountains, it’s home to a micropopulation of just under 34,000 people, giving it the smallest total among members of the Council of Europe. It’s the 3rd smallest state in Europe (after the Vatican and Monaco) and the 5th smallest in the world, with a diminutive size measuring just over 61 square kilometers, or 24 square miles—that’s roughly 60% the size of Walt Disney World in Orlando, FL, and under 5 times the size of LAX in Los Angeles. To view that from a more European perspective, it’s 20 times bigger than Monaco, but only half the size of Liechtenstein. Foreign affairs, political policies, and social trends tend to be aligned with Italy, which surrounds the entire state. 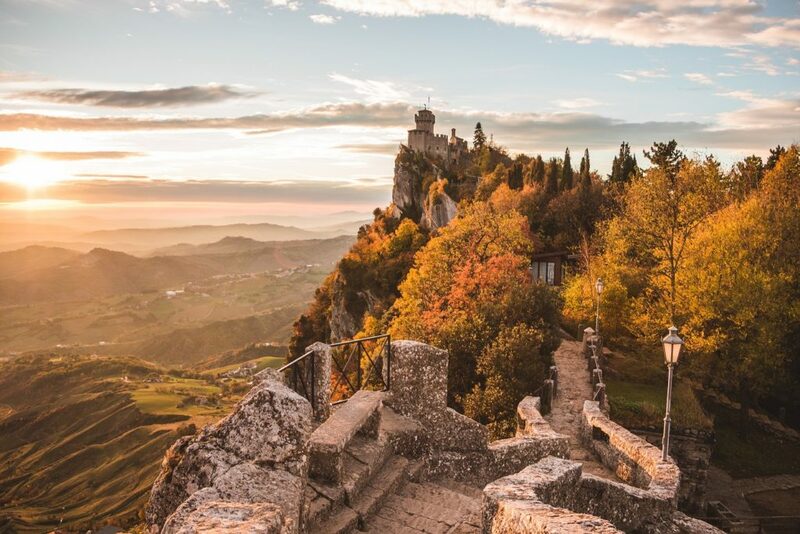 Popular Italian cities near San Marino include Rimini, Ravenna, and Ancona along the Adriatic Coast, with Florence, Venice, and Milan within a short train ride, and even shorter charter flight. Much of the nation’s historic architecture has been maintained, particularly within the capital, known for its medieval walled old town and narrow cobblestone streets on the slopes of Monte Titano. Neighboring castle-like citadels from the 11th century called “the Three Towers” overlook the rest of the country atop Titano’s peaks. The region consists of small industrial towns scattered among the mountain sides. The much more attractive capital, on the other hand, is situated high atop a mountain, providing breathtaking views of the Italian countryside, all the way to the coast of the Adriatic Sea. In 2008, the site “San Marino: Historic Centre and Mount Titano” took its rightful place on the UNESCO World Heritage List. Check them out for yourself with ACA private jet charter services in San Marino. Request a Quote or give us a call at 1-888-987-5387 to speak with one of our private jet charter brokers for your next luxury vacation, business trip, or special event in San Marino.